Break your way out of the tombs! Exploring the remains of an ancient city where you discover a secret door that leads you into a room with a mysterious artifact. You can’t help but take the artifact from the pedestal…there’s no escape now! You must pass through the labyrinth, paving the way, and battle with the Guardians of the dungeons so as not to remain an eternal captive of the ancient tombs. 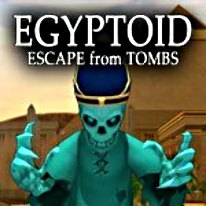 Use the ancient weapon, Egyptoid, to help you break free from the tombs!